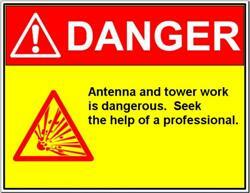 Antenna and tower work is dangerous. 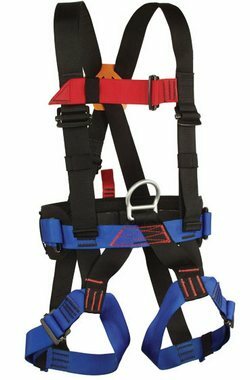 The basic component of any personal fall protection system is a full body harness designed to permit the wearer freedom of movement as well as providing sufficient strength to arrest the most severe fall safely. 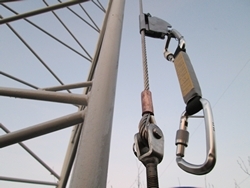 For Vertical Fall Arrest Systems PA1A is using The ANTEC SKC cable system is a safety device which complies with EN 353-1 and EN 353-2 requirements. 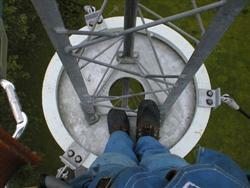 A steel cable is fixed permanently along the Tower. 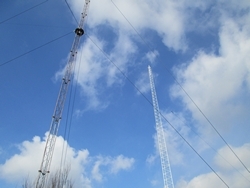 This system is based on a vertical tensioned cable system which is clamped to the top of the tower with an impact indicating shock absorber. 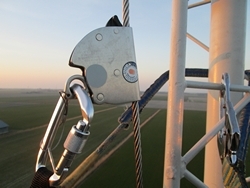 An arrester device with a double cam brake is connected to the cable and via a karabiner to the operative's harness. 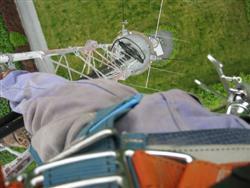 The Static Wire Rope Grab is part of a reliable fall protection system when attached to a 3/8 in. 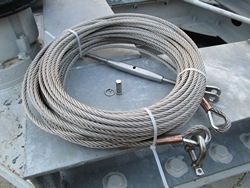 (10mm) 7x19 stainless steel wire rope vertical lifeline with Cable clamp. 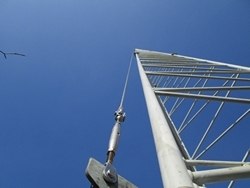 The top and bottom anchor have to be fixed on the rungs of tower with the clamping system. 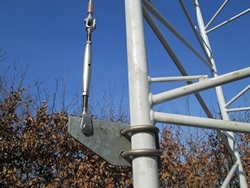 This wire rope grab is part of a fall restraint system attached either to a vertical wire or on a wire attached along a roof angle. 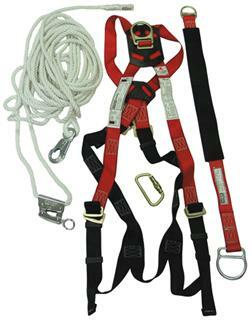 This system is designed to hold a worker with a combined total weight (including tools, clothing, etc.) 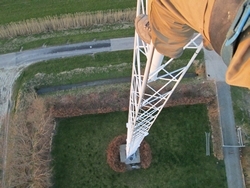 of a maximum 310 lbs. 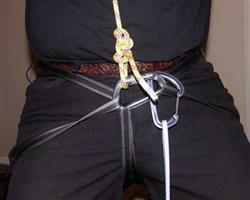 The swiveling Sleeve, attaches with a carabiner to the front d-ring of your full body harness (sleeve and harness sold separately), and prevents falls by locking onto the cable. 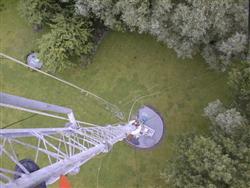 It is easily attached or removed anywhere along the cable and automatically follows as you climb or descend. 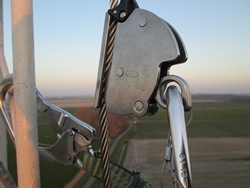 The tensioner has to be fixed to the bottom anchor with the clevis pin and the split pin of the toggle. 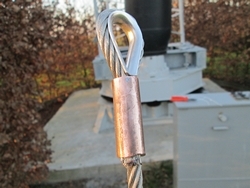 The tensioner on the cable has to be at least 10 kgs. 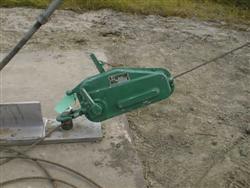 This tension will permit to avoid any cable movement and will be obtained by tuening the body of the tensioner and maintaining motionless the top toggle. 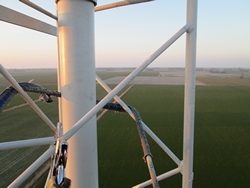 Safety is the formemost consideration when doing tower and antenna work. 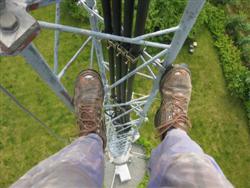 Climbing a tower is arguable the most dangerous activity you will ever engage in. 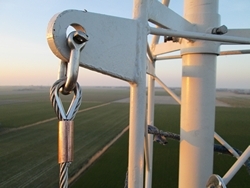 When you work on the tower you need a combination of two lanyards. 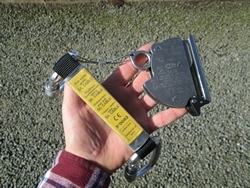 The fall arrest lanyard to keep you hoocked when climbing, and the positioning lanyard.